Kangxi reign mark but late 19th century ? I have a ginger jar that has been identified online as having Kangxi reign mark but produced in the late 19th century for the export market. The online appraiser said if it were the real thing of course then it would be a very fine piece. What I'd like to know is, how can one tell if its Kangxi or an homage to Kangxi? What are the tell tale sings? It's been valued at 50 - 70 GBP . 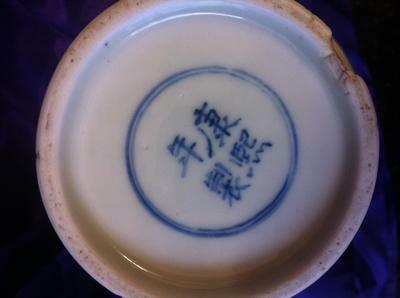 Comments for Kangxi reign mark but late 19th century ? Thanks for your comments Peter. I have no idea if it could be Japanese at all. Did you get the other pics I posted that showed the lid etc ? Still not sure about this, I'm afraid. Could not see any signs that it is printed. The color would be fine for Qing dynasty, the shape 'might' be okay, except that I do not feel comfortable about the lip at the top edge, and about the fact that the painting is going to the very top edge. Could it be Japanese, despite its decoration, or 20th century? I don't know. I would leave it at this for the time being. Keep watching for similar items. Shelley, we are talking about the 'transfer' printing method. This was not widely used in China until about the second half of the 20th century. 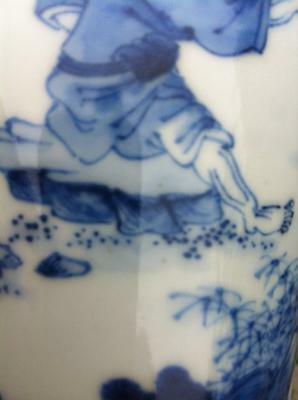 Modern printing methods could be more difficult to recognize, perhaps, but then they would require a perfect porcelain body (not handmade but mass produced); this makes it possible to detect them. The in-depth appearance of decoration and age signs would be difficult to reproduce with printing. And never forget about the look of the bottom. I understand what you said concerning the above, but then fakers can make copies from hand painted designs and then print them. So in that case, printed images will keep all the characteristics of hand painted ones. This aspect puzzles me a lot when I try to detect fakes. 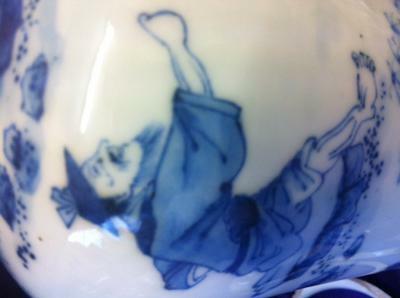 With better quality transfer printed porcelain you might need a magnifier to see this. 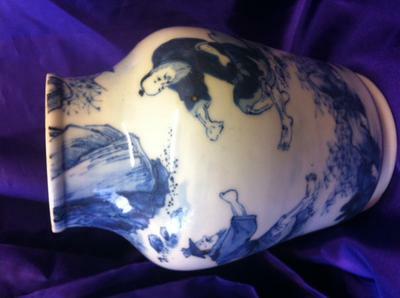 Hand painted porcelain shows clearly the brush strokes as such. At the beginning a stroke will be darker as the ink/color is plenty. Towards the end the width of the stroke decreases due to the color in the bristles getting less. That may be different if a hard tool is used for drawing. The most obvious thing, however, is the intermittent strokes. With printed decorations you will find that the "painted" line is all the way the same width, and/or that there are white spaces in the stroke. There is no reason that a single hand painted brush stroke should be broken intermittently with white spaces, as it is drawn in one go. You can also look for repetitive elements in the decoration and see if two or more are exactly the same. With hand painted ones no two are exactly the same. Could you explain how to tell the differences between hand painted or printed porcelain? Thanks! First, this isn't a ginger jar. Ginger jars have a different shape. I have strong doubts about the authenticity of this jar because of its shape. Especially the top rim is strange. 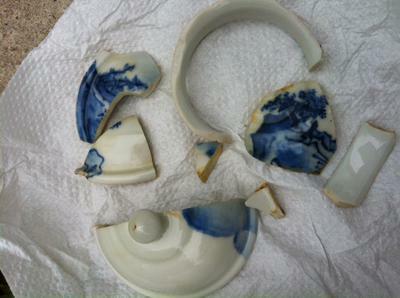 As far as I know there is no such shape in traditional Chinese porcelain, and Qing dynasty porcelain was not painted that way on the neck. 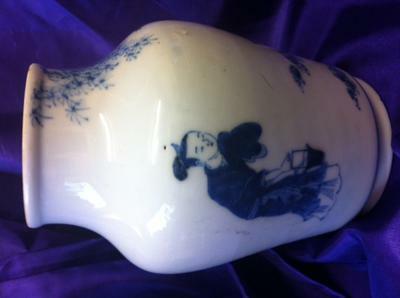 The shape looks as if the upper part of a vase was cut off, but the lip along the upper edge does not fit this picture. The decoration itself also looks as if was cut off. Can you provide closeup (partial) pictures of the rocks and one or two other places? Really close pictures, suitable for viewing minute details and brush strokes. I would like to make sure this isn't printed. Not sure how to add additional pics to original post so have posted here. 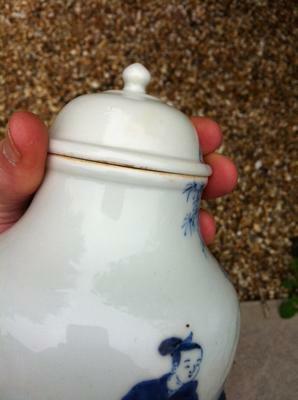 As you can now see the lid would have been a continuation of the pattern. As you can see the lid is broken but I have several if not all the bits.